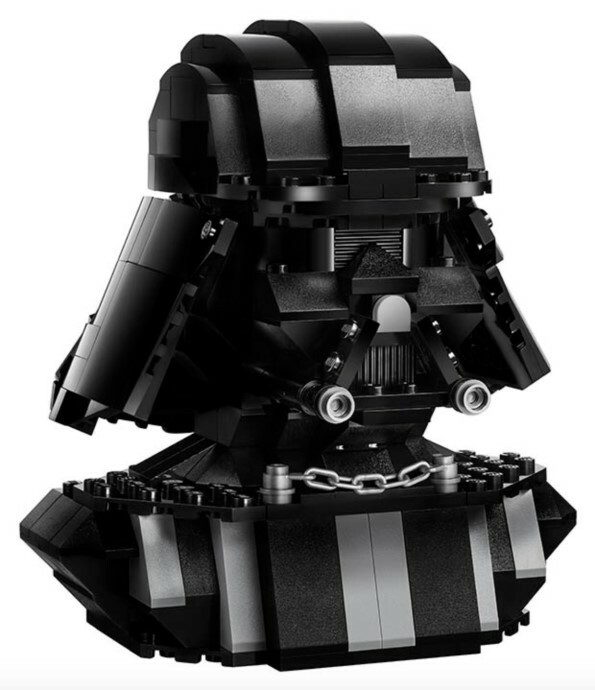 75227 Darth Vader Bust revealed! 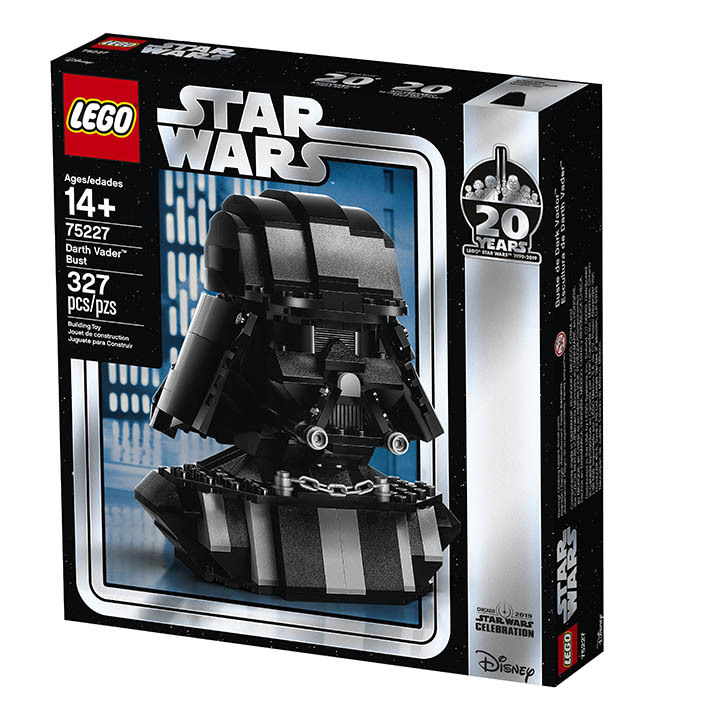 Star Wars Celebration will soon be coming to Chicago, Illinois in April, and LEGO is getting in on the galactic fun with the limited release of 75227 Darth Vader Bust, designed to celebrate the 20th anniversary of LEGO Star Wars! The set will also be available as a Target exclusive. We will give a release date once it is discovered. What do you think? Catch a box image after the break, and leave your thoughts in the comments below! What am I saying? This is 2019. Of course it will. I like it, I think it looks good but if the supposed price points I'm seeing here are correct, this is way overpriced. I don’t care anymore, sooooo sick of all the exclusives. TLG have lost a huge collector. Sayonara. 'Way overpriced' is the new slogan for LEGO in 2019. The lenses are much too small and look extremely weird. And they should have been trans-red on black. So it will be exclusively over priced at Target and I will likely need a Red Card to boot probably to even be considered to possibly make the limited release/cutoff window!? OR, I can buy it the same day on eBay for 5 times the cost. Welcome back to the idiotic Lego Movie 2 Brickhead release. No thanks. The eyes are a bit lost on here, which is a shame as that's his coolest feature, but otherwise looks great! The BrickHeadz Darth Vader looks better. These kind of sculpture pieces aren't really my thing, so I'll pass. Use of a textured brick between the eyes makes it look more like Kylo Ren than Darth Vader. Maybe the eyes should be trans red with a black piece behind them. I guess I'm nit picking a set I don't plan on getting. I like this bust a lot. I also loved the Ant-Man one from Comic-Con last year. This is one of those sets where I wouldn’t be super upset if it was a convention exclusive (like the Ant-Man bust was), but if I have the opportunity to get it at retail I’ll gladly pick it up. $50 seems a bit expensive, though. I was expecting $30-40. Might wait for a sale. Undecided on the set, hope to see some more photos before it goes on sale. Since it will be a "Target exclusive", I hope they DO make it a RedCard exclusive with a low purchase maximum to make it more difficult for the industrial scalpers that buy up the Black Friday deals for resale (looking at you, ToyWiz). It looks just meh, and I'm tired of all these exclusives. I never bought the Yoda or Darth Maul busts, when I was in my prime of SW Lego collecting. And now that I'm pretty much done with the theme, I'm really not getting this one (even though it's probably the best-looking of the three and the most appropriate of the three to be represented by a bust model). Seems like a $30 set that’ll have an MSRP of $50 and go for $100+ on eBay, haha. Exclusive items aren’t funny anymore..
And how can it get a normal number if it’s not available worldwide? Do we really need another Vader after 2 almost identical Buildable figures, countless Minifigures and Merchandise? The bust looks really weird with the edged head and without the bulky eyes (could have put those Porsche headlights to good use for once). Maybe in a much larger scale it would have looked acceptable... These anniversary sets are all kinda useless and boring. I FIND YOUR LACK OF ENTHUSIASM ON THIS DISTURBING lol..
Not a bad set, a fairly good rendition, but even as a long and huge Lego and SW fan and collectioner, I would not buy it, would it be available everywhere. But it's out of what I like in lego (minifigs, ships, vehicles, locations, and a few buildable figures). And I am now really, really fed up with exclusive sets, available at a small scale for a few people. I'm even getting somehow "angry" with exclusives, even when they don't interest me. I think it's not fair. Keep my hard earned money for 2 new Ties (from Resistance) released in April. Merges the two old maul and yoda sculpture sets into one, perfect anniversary piece. I'm not a SW fan but I think it looks really good. GOOD NEWS! It’s only $40. Couldn't we have gotten something more similar to the darth maul bust? I would like to see a full series of star wars characters Busts! Something like the Brickheadz but more realistic! Don’t like it. It is a total bust. To those saying it should have red eye lenses, he only had that in Episode 4 of the original trilogy. His costume was tweaked in Episodes 5 and 6, where his lenses were no longer red. I just read on another site that it will be limited availability at Target, April 11th as a RedCard exclusive. Once again LEGO teams up with Target to push their RedCard program. This is honestly the dumbest thing to require consumers to do. And what if someone is denied a RedCard? That person is not eligible to purchase the product (I’ve never had the interest in applying, but I’ve heard that it’s just a Target credit card)? What if someone doesn’t live near a Target? They’re not exactly as frequent as WalMart. This ponying up to retailers is truly a load of garbage and makes me lose respect for TLG. Also, it’s really not that large either if you look closely, it appears to be no bigger than a Brickheadz at most. Definitely buying this if I can get my hands on it, and assuming this won't be treated like the lego movie birckheads. Too ugly. Too pricey. Too exclusive. This exclusivity for certain sets is super annoying. It makes it pretty much impossible for many of us to obtain these things. I guess when your making billions LEGO don't give to hoots. I wonder what colourful bricks they used inside. I'm sorry, but I think I'm just done with STAR WARS. @Phathead the Redcard can either be a credit card or a debit card tied to your checking account. If you have a checking account you won’t be denied a card, unless you committed fraud there or something. There aren’t quite as many Targets as Walmarts, but there are still tons. How is this any worse than a Lego Store exclusive? As has been said another thing a very high percentage of people may be interested in, My daughter is 6 and she loves Star wars / Vader, I'm 44 and do too, everyone in the middle may too, most people have heard of him, and if you like Lego.... its seems a perfect match. Give us ALL a choice, rather than the 1000% mark up on Ebay. And as people say having to apply for some kind of card to get one is shocking. Whats next 2020 Technic sets are only available in Target stores if you have a $1000 owing on your credit card. So... does this mean there is no chance of getting it in Europe except if you can afford the (probably ridiculous) price on the second hand market? I'd planned to purchase all 20th anniversary sets, but I guess I can give up on that now. I'm getting tired of all those exclusives. Why are lego only making these sets available in the usa? They are creating resellers market. Next lepin and similar will be selling these worldwide. So after the flop that was 40 years of Technic, we have an utterly "Meh" Stars anniversary so far. A completely unremarkable set that is exclusive, too. Way to go. ^ C’mon, 40 years of Technic wasn’t that bad...we did get a printed piece, right? Another "Target Exclusive". Right. Thanks LEGO. It's a small mercy that it's crap. Only with a Redcard? Nope. I'm done shopping at Target. I really think lego should start dropping "building toy" from the front of some sets. False advertising really. A toy is defined as an object for a child to play with. This is just a $50 collector / scalpers piece. So, as there is no more Target in Canada it will not be available here. Thanks lego! I don't see the point in designing a product and then limiting its availability, it only helps scalpers on the secondary market. As I can't get to US conventions and target doesn't exist in UK that's a large volume of customers to whom this is unavailable except on secondary market at a huge mark up. @andyh1984, while most of us probably don't like exclusives, it's something easy for Lego to do. They don't have to make a large number of sets, and it's a good way for them to get publicity. Plus, being an exclusive, they're able to charge a little more than normal. The mere idea that something is exclusive helps drive sales, even if the object isn't that great. It does lend itself to scalpers and inflated prices on the secondary market, but that doesn't hurt Lego financially, since they've already gotten the money they're asking for. monkyby87 is 100% right. But forgot that if LEGO knows a set will be scalped that would make them increase the price of other sets. Just look at the corner garage modular being $20 more than it should be. They know in 5 years it will be $300 anyways. Nice! Another set we Europeans can never get!!! Do you not notice that everyone the is a higher priced set is a Disney one? They are probably laying off the extra cost of doing business with them. Thats really nice. What are the chances it will be available on this side of the pond? Not interested. It's a mediocre set among hundreds of better SW sets. Surprised about the eyes...they really don’t look good. I’m not at all shocked at pricing. Lego is starting to take the fun outta this. Weird thing to devote a whole article to, but you do you. I think that it’ll look better in person than it does in the photos. It seems to me like the photographer was trying really hard to get the black to read well; I think that models mostly made from black pieces are hard to get good images of. The real life version might be quite appealing.